Montana Wheat! We moved to Montana a couple of years ago, and we discovered this through the hotel restaurant kitchen where I work in Big Sky, Montana and every grocery store in Gallatin County from Walmart to the local co-op carries it. I was so excited to see it here! Thanks so much for this post! I would love to grind my own wheat sometime in the near future but for now it’s not an option. So I really appreciate that you took the time to write this. I usually just opt for unbleached flour from the grocery store which I know is still enriched, but my husband hates the whole wheat from the store. And it seems that the white whole wheat is much more expensive in the store. We don’t have Whole Foods or Trader Joes nearby for the special stuff. All of that to say, I think I’m going to get some of the Prairie Gold from this post! Thanks again! Has anyone tried King Arthur Flour Organic white whole wheat? I have tried it. It is a great option! I didn’t like it as well as Prairie Gold from Wheat Montana, but I do think King Arthur is a good option if that is available to you. I LOVE Trader Joe’s White Whole Wheat. It is cheap, can be substituted one for one in recipes calling for AP flour and all Trader Joe’s brand products are non-GMO. I substitute TJ’s white wheat in most recipes calling for AP without any complaints from my family. I tried King Arthur once when TJ’s was out of stock. It was fine, but more expensive and needs to be adapted for use in regular recipes. The King Arthur on-line baking consultants recommend adding extra liquid to recipes when substituting one for one in recipes calling for AP flour. I use King Arthur white whole wheat, but only the non-organic, which is usually a little over $3 a 5 lb. bag. The organic version I’ve only seen in 2 lb. bags, and at a higher price. I just can’t do that. I love King Arthur. It’s the only brand that carries white whole wheat at my grocery store. After trying white wheat, I won’t go back to “regular” hard red wheat! I buy the Wheat Montana white wheat from Walmart, it’s wonderful, but the King Arthur is a close second. I am not a fan of the Trader Joe’s white whole wheat – it’s not ground finely enough in my opinion. by the way – I followed the link to the Wheat Montana flour on Amazon and there is another option for 50 lbs as low as $29.54 ($0.59/lb)! Wheat Montana farms are less than 10 miles from my home. It’s the only flour I use. :-) I’ve been using the Bronze Chief, though. I’m going to give the Prairie Gold a try as I think that’s been the difference in my muffin batter as compared to yours. We are die-hard Bob’s Red Mill fans. They are non-GMO, have organic and non-organic, and have a huge selection of gluten-free products (as well as tons of other products besides flour). Interestingly, we recently recommended this flour to my husband’s boss. He had said he couldn’t eat much flour because it made him not feel well, and had discovered it was an allergy to malt, I think it was, which is an ingredient in a number of brands of flours. I noticed that it was not listed in BRM, so he started using it and is very happy to not be having whatever problems he was having before. Bob’s has a great website (bobsredmill.com) and his products are sold in lots of stores all over (and on Amazon.) And if you happen to be in the Portland, OR area, the mill and store are fun to tour/shop in and they have a restaurant with delicious sandwiches, etc. I second the recommendation for Bob’s Red Mill flours. I love their whole wheat pastry flour. I use it for pancakes and cookies, predominantly. I live in central Minnesota…so no Whole Foods or Trader Joes here! I buy North Dakota Mill Hard White Wheat flour. Several small and larger local grocery stores carry it and it is often on sale for $1.99/5 lb bag. It is not specified as non-GMO/organic, so may check into the Wheat Montana from Amazon…I can get it at Walmart but not for a great price! Thankfully, white whole wheat flour has become much easier to find…although not all is ground fine enough to make a nice yeast bread. 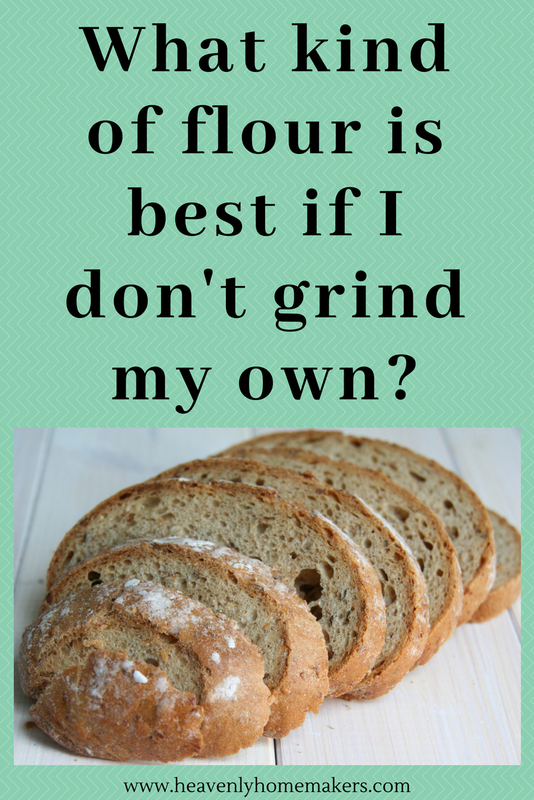 I grind my own flour and it was this website that “put me over the edge” so to speak. It was the first place I found on the web that offered more than a hand-made bread recipe. I still use my bread machine with a recipe from The Bread Becker’s that I only slightly altered. I buy my wheat berries locally from a Mennonite woman who only sells Montana Wheat! I get Prairie Gold hard and soft white and Bronze Chief hard red. I use a mix of red and white for my bread because I like the flavor of a wheat bread. Wheat bread is all my children have ever been offered at home and people were amazed that my little kids would eat wheat bread! I’ve been doing a lot of experimenting with the soft white and have found that sifting it two or three times gives me a flour that acts almost exactly like regular old AP flour. 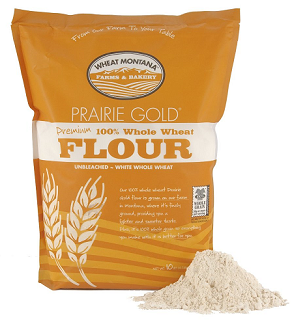 I have bought the Prairie Gold white wheat flour in the store before I had a mill and I really liked it. A friend who has a gluten-free son highly recommends Bob’s Red Mill products. I live about 20 miles from the Bread Beckers business. That is where I got my Nutri Grain Mill, my bread machine, and a Electrolux mixer. I bought my wheat there for years. After using Montana Wheat I now buy it at a place in Duncan, SC as we go to Charlotte,NC to see our son. I use several of the Bread Becker’s recipes. I live about 30 miles from Duncan, SC and have been looking for a place to buy whole grains…could you tell me the name of the store? I found a small group that orders bulk grains, sucanat, etc from a company called Dutch Valley, but they take a really long time to get up enough orders to meet the minimum requirements. How funny!!!! It is called the Grain Loft just off 85. Their names are Pat and Jacque Schaaf. I have not met his wife but he is so nice. The number is 864-848-7199. Tell them a lady from GA that visits her son in Charlotte recommended them. My son looked online to find me a Bosch Mixer is how we found them. They also have classes on many different things. Wish I lived close enough to go to some. I have gone to some at Bread Beckers. I use one degree sprouted whole wheat flour! I want to be able to make sure our grains are soaked and prepared correctly but I don’t have a lot of time to always soak the flour. So, I love that this is sprouted and has gone through that process. It makes great bread and cakes! My first choice is Trader Joe’s white whole wheat. It is 5 pounds for 2.99. It is very fresh because they sell so much of it. It does very well for all of my bread and cookies. My second choice is King Arthur white whole wheat at 3.29 for 5 pounds at my store. It is not as fresh as TJ’s so I only use it if I have not had a chance to get to TJ’s which is 25 miles away. I I do hope to purchase a grain mill at some point but it is not in the budget right now as every penny is being thrown at paying off the house. I get King Arthur White Whole Wheat from Whole Foods but it’s pricey, 5 or 6 dollars a bag. My Kroger carries Gold White Whole Wheat for less money, but it’s not a good flour in my opinion- kind of gritty. Yeah, it’s all a little overwhelming, huh? I feel that way about so many other foods too, from produce to brown rice. I really have landed on the peaceful conviction that white whole wheat is just fine for my family. 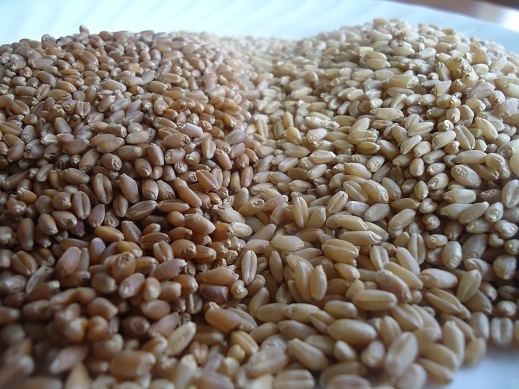 Are the ancient grains better? Yes, actually, they probably are. But does that mean organic or chemical free white whole wheat is bad? No, I don’t think so. I love the Prairie Gold flour! I also like that I can actually pick it up at my local Walmart! When I have the chance (and the money), I purchase einkorn berries to grind up. That is the BEST I have ever had, but it sure is pricey!! I was just wondering about this very thing! Thank you so much for posting this…..I do have a question on how you would store this much flour? I have 3 kiddos, 4 and under, so right now this would last us a little while. Some day I would like to grain my flour but for now I get it at the store. I fall head first off healthy food wagon. So starting from the beginning. Right now I have mix white and whole wheat flour. I grind ours. 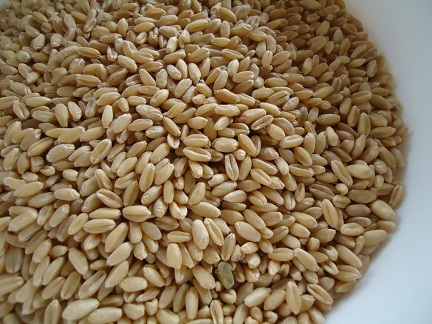 The white whole wheat is wonderful so is the soft white wheat for a pastry like flour. The nutrimill is the best invention on Earth. Got it at Paulas Bread. My wheat is Wheat Montana, hands down. And for the very few occasions that I do still use white flour, it’s only Wheat Montana. And as another poster mentioned, einkorn is wonderful. But at twice the cost of wheat it’s a LITTLE cost-prohibitive!! Does this mean I should be freezing my store bought white whole wheat flour? If so where did you learn this? I generally put in the fridge as soon as I bring it home. I have questioned the possible of rancidity of store bought, but just didn’t feel like I had time in my life for one more thing (grinding my own flour). Though frankly, I thought the wheat had to be ground immediately before each use. it is nice to know fresh ground wheat can be ground in advance and frozen. I will definitely look into it when I have the time. Hi Kristin – I would definitely freeze it. I first learned about doing this about 15 years ago when I took a bread-making class after I bought my grain mill and Bosch mixer. I have a few books on grinding grains and using freshly ground flours and I believe they also mention slowing the oxidation process by freezing the flours – I can find the references for you if you’d like. I also store any other grain I grind into flour (including corn for cornmeal) in the freezer. Even my Wheat Montana all-purpose white flour goes in the freezer. Not to slow the oxidation process — it’s already been stripped of the germ and bran and basically void of nutrition — but to keep any weevil larvae from hatching, especially since I don’t use white flour nearly as much as I do the whole wheat. Weevils are commonly found in commercial flour – not a big deal as long as you don’t get an infestation. The larvae can’t survive the freezing temperatures. Also, if you ever find any bugs in your grain, you can stick the grain in the freezer for three days and it will kill any eggs the bugs have laid. Other than the “yuck” factor, your grain can still be used with no ill effects. This would only work if you find a couple bugs in a bucket or bag. If the bucket/bag appears to be infested, just get rid of it. Sorry for the wordy response. Hope it helped! Would you tell us what other things you get from Amazon’s Subscribe and Save? I live in a smallish town, with one Kroger and one Walmart, so selection is limited! Plus, shopping is generally difficult due to an autistic teenager, so the more the UPS man can deliver, the better! I never thought of having him deliver my flour. I find that I buy a LOT of great groceries at a discount at Amazon. Here’s a page I update regularly of items I find for a great deal: http://heavenlyhomemakers.com/amazon-deals. You’ll also want to read this page to learn more about what I get with subscribe and save http://heavenlyhomemakers.com/why-i-dont-have-a-sams-or-costco-membership-and-how-i-get-great-bulk-deals-delivered-to-my-door. It’s amazing what can be delivered to your door and save money too! I can’t find the prairie gold Montana wheat deal you mentioned or the one another subscriber mentioned for 50 lbs at 25 something. Any ideas how to find it? I’m still looking, but the cheapest I’ve found on Amazon is still $1 or so a pound. Looks like we bought them all out, so the price changed. I’ll keep watching for the price to go down again, and I’ll be sure to share! I was able to snag a 25 pound bag of Montana Gold for $19.38 yesterday on Amazon. I’ve only used BRM white whole wheat so I thought I would try this other brand to compare. Looking forward to trying it! Was so glad to hear you say you like the Prairie Gold flour! That’s what I’ve been using for quite sometime now. Well, ever since our Wal Mart started carrying it. I buy Prairie Gold flour in 50 pound bags, but I have also had good results with King Arthur and Gold Medal white whole wheat. I am a Michigan gal and shop at Meijer. Meijer Naturals brand also has white whole wheat flour now that is good and a bit cheaper. All Meijer Natural products are non-GMO and chemical-free. I haven’t seen Meijer brand white whole wheat flour. Did they just start carrying it? I’ll have to check it out. I think they have had it for about a year. 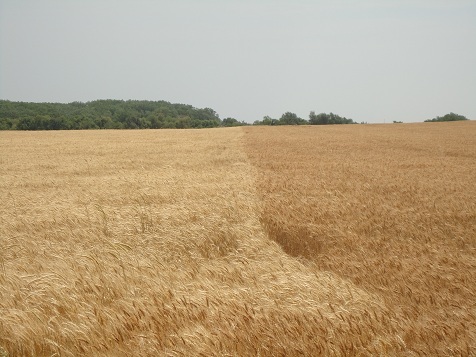 They have both red and white wheat varieties. My favorite brand of flour is Great River Organic Milling. I get a 25 lb.bag of their whole wheat pastry flour from Amazon Subscribe & Save every month. It’s the best flour I’ve ever used!